Hi friends can anyone show me the steps to shut down the computer using windows 8 release preview in details in all the ways? Why the shutdown is not working in windows 8 release preview? Gow can I fix this issue? Windows 8 release preview shut down when press the sleep button? Re: Steps to shut down the computer using windows 8 release preview in all the ways? 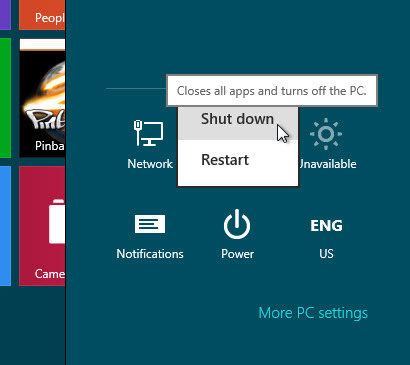 You can shut down your computer using windows 8 in more that one ways. Take the mouse to the lower-right corner and wait for the on-screen menu tab to appear. Now click on the settings option. Click the power option in the settings windows. Click on shut down and the windows will get shut down. Win +SHIFT+ I(shift because capital i is needed). Now the setting panel will slide out. Just click on the power button followed by shut down option. 1.One way is to simply press CTRL +ALT+DEL a keyboard shortcut. 2.If you look at the bottom right corner there you will see power management options like RESTART,SHUTDOWN,SLEEP. 3.Click on that of your choice. -->there you can select of your own choice. Shut down windows 8 is very easy. Just follow these simple steps and you will be able to shut down your computer. 1)point the mouse to the upper-right corner of the screen, move the mouse pointer down, and then click Settings. 2)Click Power, and then click Shut down. now you PC will be shut down. After the work in our desk top or Laptop in windows 8..
-->use the mouse button and in the windows button in the key board to chose tem your computer is easy to shout down..
and select windows + I to settings the ower button is on/off to choose and getting them..
Now the setting panel is setting on it..
t.jpg shout down the option in that tool bar..
it is easy to way of shout down in the windows 8..
:--> Press "alt +f4" key board short cut to shut down window. :--> you have to take the cursor to lower right corner and wait there to open on screen and then chose setting and then power option it will show you the option to restart or shut down your computer. Just follow the steps for solving your problem. Go to right corner of your screen. wait one min. and then setting appers. choose setting and it will show you shuting down option. Choose it for shuting down. It not a hard work . Just go to right corner of your Desktop. Wait 1 min. A box pop up. Choose "setting". In setting you have to choose "power option ". There you can shut down your computer. 1.Firstly close all the tabs and proceed to the right-bottom of your computer. 2.There you wait for a while then a menu box will appear. 3.it consists 6 options there you make a click on the option 'Power'. 4.Now a sub-menu with two options 'Shutdown & Restart' will open. 5.There you click on the option 'Shut down' to turn off your computer. That's it by doing as i said you can make your computer to shut down in Windows 8.